One of my first childhood dolls was Thumbelina by Ideal. 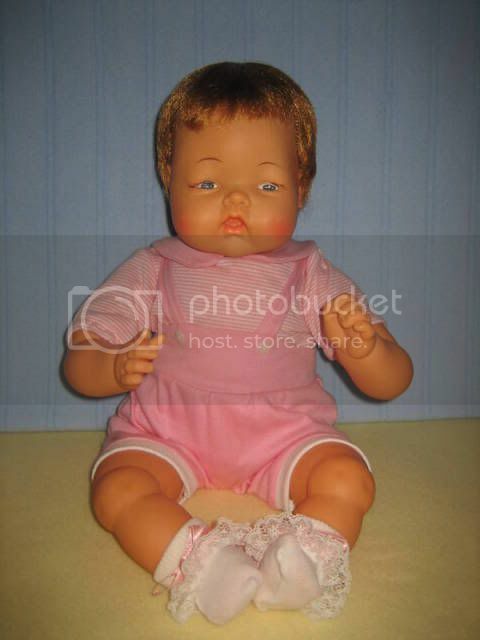 First produced in 1961-1962, the doll had a wooden knob in its back. When turned, it wriggled or squirmed like a restless infant. Although we were as opposite as day and night, Thumbelina was one of my constant childhood companions. 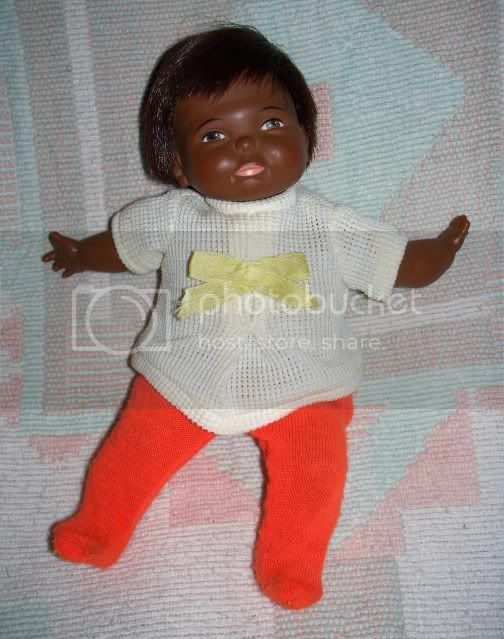 As an adult collector, one of my first vintage play-doll acquisitions was another 1960s Thumbelina that I dyed brown. 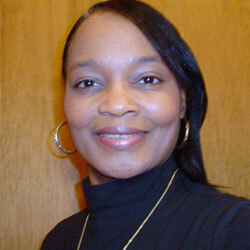 She became a nice stand-in for the original black, elusive 1960s doll that can command as much as four figures. Several other authentic, black versions, purchased on the secondary market during the 1990s, entered my collection. These were manufactured from 1971 through 1983 and possibly as late as 1985. Newborn Thumbelina was the most difficult to find and the most costly. Only 9 inches tall, instead of a wooden knob, Newborn Thumbelina has a pull-string, which activates her wriggle-like-a-real baby movement. She wears her original outfit. From wooden knobs and pull strings to batteries, Thumbelina remained mechanical in 1976 with Wake Up Thumbelina. Aided by two D batteries and pressure applied to a lever on her back, Wake Up Thumbelina slowly raises her head, turns from side to side, puts her head back down, and finally rolls over on her back and holds out her arms to be picked up. 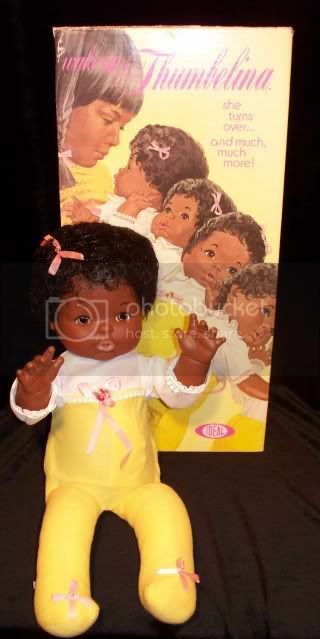 The watercolor graphics on the box illustrate the doll’s movement and a little brown girl’s delight as a result of it. A pair of 1983 Classic Thumbelina dolls use the 1960s head sculpt. They are identical except one has molded hair; the other’s is rooted. Both have a “Ma-Ma” mechanism. Thumbelina with rooted black hair and brown sleep eyes measures 20 inches. Marked 1965 on the neck, the doll was made after 1982. 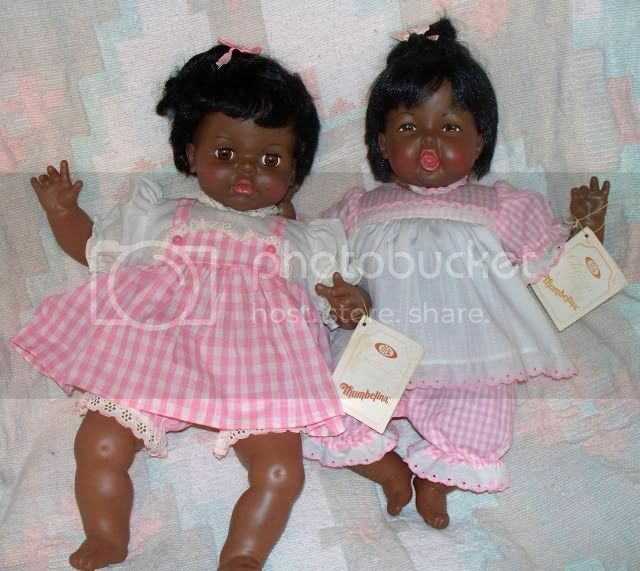 Another rooted hair version with a yawning mouth wears a similar dress and has a 1983 box date. Both have “Ma-Ma” voice boxes. At a mere 7 inches, Baby Thumbelina from 1982 is one of the smallest of the bunch. She is not mechanical. 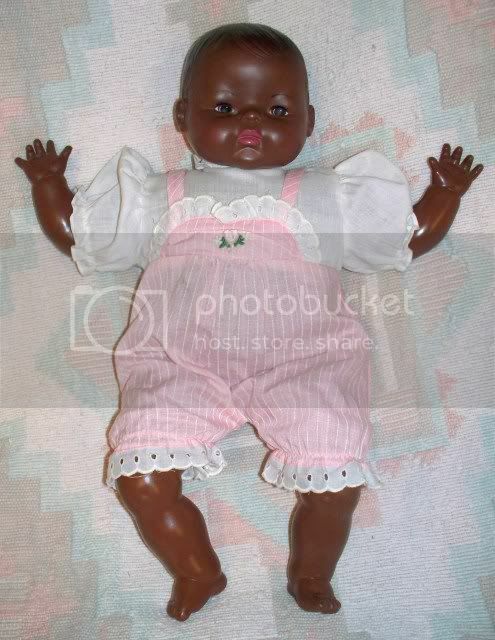 Her box indicates a Dominican Republic manufacture for the doll while the outfit (a diaper) and carry-all were made in Haiti. This molded hair version with painted eyes from 1982 has such a sweet face. I found her a thrift store for the even sweeter price of $12. She is 20 inches, wears her original pink romper and white blouse, and has a working “Ma-Ma” device. 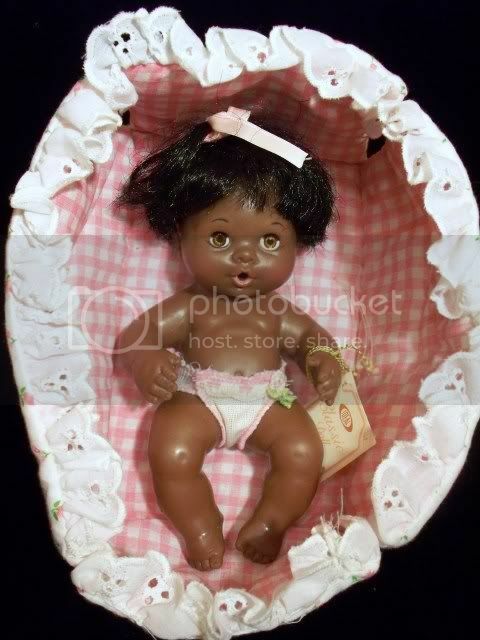 In 2003, Ashton-Drake (Collectiblestoday.com) teamed with Mattel to reproduce the 1960s black Thumbelina complete with wooden knob to control the wriggle mechanism. 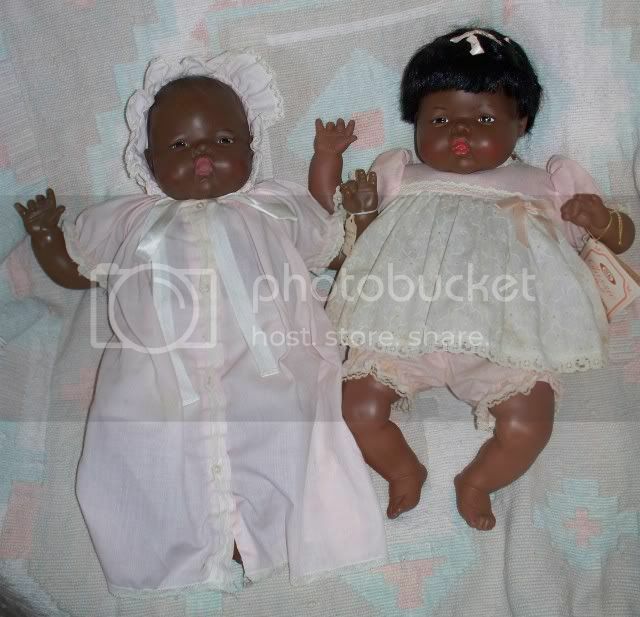 The reproduced doll wears a blue romper and white blouse, a replica of the 1960s outfit. She displays well with the dyed doll and Newborn Thumbelina. In addition to my original 1960s white doll, another Thumbelina from my past is So Big Thumbelina . Made in 1983, So Big was another secondary market, 1990s acquisition. Measuring 25 inches tall, with a face only a mother could love; I found a new home for her shortly after her arrival. I tried my best to love her, but I just couldn’t. Except for her mint in box status, my version was identical to the one shown at the previous link. 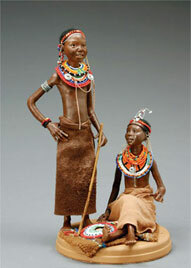 A molded hair version was also made. These are the members of my Thumbelina family. 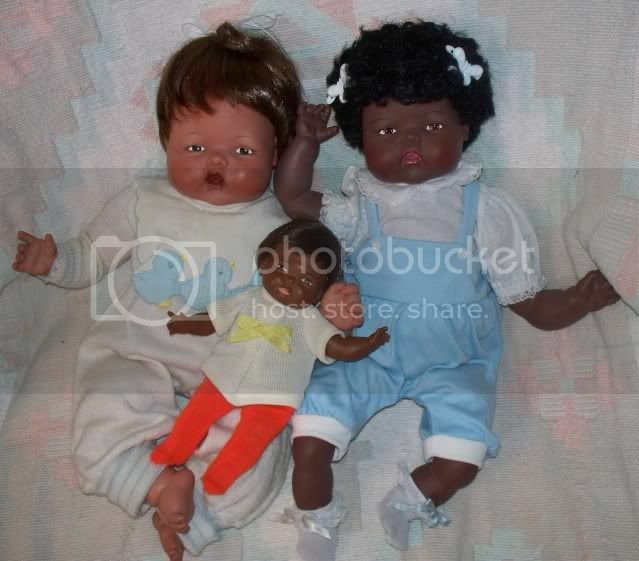 Until gathering the dolls from their various locations of display and photographing them for this blog, I had no idea this unique group of dolls totaled 10. PreviousFlirting with Disaster: A Tragedy with Titanic Results!